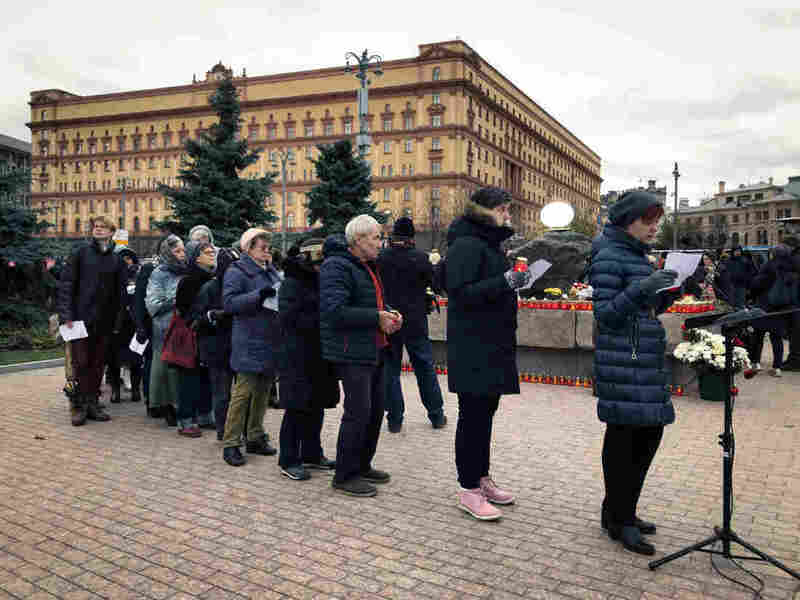 Russians Honor Victims Of Stalin's Purges Outside Moscow Security Headquarters A lawyer attending the "Return of the Names" event said it was a rare occasion to express discontent with Russia's present government. A woman places flowers at the Solovetsky Stone monument in front of the former KGB headquarters in central Moscow on Monday. 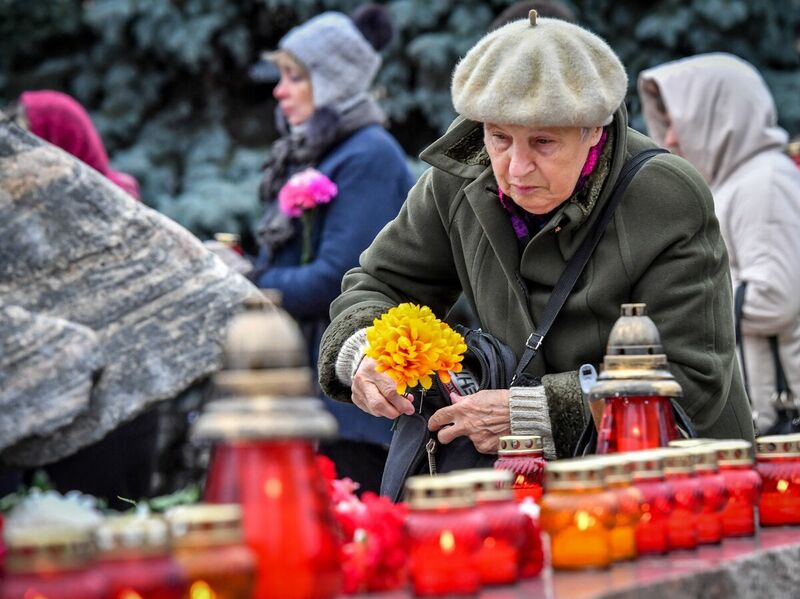 Dozens of people gathered there to remember the victims of Soviet-era political repressions. Nelli Tachko stood on Moscow's Lubyanka Square and pronounced the name of her father, Stanislav Frantsevich Tachko, a postal worker who was executed at age 41 by the Soviet secret police. Tachko, 93, was one of hundreds of Muscovites who waited for hours in frigid temperatures Monday to take part in an annual tradition in which anybody who wants to can read the name, age, profession and date of execution of a victim of Soviet dictator Josef Stalin's Great Terror eight decades ago. "This is an amazing, unique, wonderful event — and we can hold it only here," Tachko said after placing a votive candle next to the Solovetsky Stone. The memorial stone, from one of the Soviet Union's first prison labor camps, is located near a busy intersection, across the street from the headquarters of the FSB, the security service that succeeded the KGB. This year, Moscow City Hall wanted to move the "Return of the Names" event, citing ongoing construction work on Lubyanka Square. Following protests by the organizer, the human rights group Memorial, the city backed down and allowed the reading at its usual place, from 10 a.m. to 10 p.m. on Oct. 29. "We insisted the event take place where it's always been," said Nikita Petrov, a historian with Memorial. "It's a very important place symbolically. And for the government it was important that the event happen somewhere else, just not on Lubyanka Square, where the center of political terror and Soviet repressions was located." As an alternative, the city proposed the Wall of Grief, a monument to the victims of Soviet-era persecution opened by President Vladimir Putin last year. Petrov said that option was unacceptable because it's an official memorial that was opened for political reasons. Muscovites line up to take part in an annual reading of the names of Stalin's victims. "On the one hand, Putin says the right words that the repressions can't be justified, but, on other hand, he's conducting new repressions that continue in the worst Soviet traditions," Petrov said. Memorial, which was first headed by Soviet dissident and Nobel laureate Andrei Sakharov, is itself under increased pressure. The Russian Justice Ministry has registered Memorial as a "foreign agent," and two of its regional directors — Oyub Titiev in Chechnya and Yury Dmitriyev in Karelia — have been saddled with legal cases that the organization says are fabricated. The Stalinist purges of the 1930s destroyed millions of lives, with innocents often executed summarily or worked to death in the Gulags, the Soviet prison labor camps. Although the repression didn't touch her family directly, Yekaterina Ivanova, a Moscow lawyer, said the Return of the Names was a rare occasion to express her discontent with Russia's present government. Her 15-month-old daughter, Alexandra, was bundled up in a stroller beside her. "It's important to remember so what happened then can never repeat itself," said Ivanova, 34. "That's why I've come with my child, so she can understand from her earliest years how important it is." Georgy Volkov, a 17-year-old student at a government academy, said he was at the reading for the first time as he explores his own family history. A great-grandfather was killed in the Soviet Union's 1939-40 war against Finland, and his wife was sent to the Gulag. "It will be a new tradition for me to come to this place every year and name names," said Volkov. He said young Russians know too little about the Stalinist repressions, but that he wants to set an example for his generation — and for those that come after him.